Neurobiological phenotypes of schizophrenia can be strategically studied in unaffected relatives to parse out susceptibility phenotypes involved in core pathophysiological mechanisms from phenotypes reflecting consequences of the illness or its treatments. A prime example of this strategy is the work by Grimm et al1 in the current issue of JAMA Psychiatry. The authors showed that unaffected relatives, like their affected counterparts, show a robust deficit in activation of the ventral striatum to anticipation of monetary outcome compared with healthy individuals. This finding strongly suggests that deficient anticipatory activation in the striatum represents a functional phenotype of genetic susceptibility to schizophrenia. 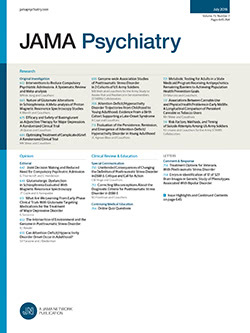 Supporting further the use of this phenotype for genetic research, Grimm et al went on to show that, within the healthy comparison group, carriers of a risk allele of the NRG1 candidate gene for schizophrenia have relatively reduced activation of the ventral striatum to anticipation of monetary outcome compared with carriers of a protective allele.